SEATTLE, Wash. (WTVD) -- For the better part of 3 quarters the Panthers were pretty much the equal of the defending world champs. Amazing really given the fact that they spent the better part of the game constantly pinned back in terrible field position and staring down the barrel of the league's top defense and most fearsome crowd. As Cam Newton said afterwards though "I didn't put on my helmet to bow down." 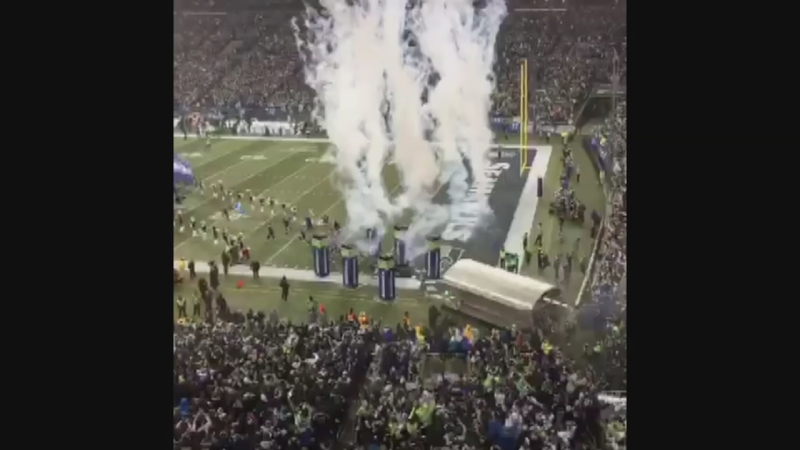 The first sign of that had come before the game when Newton purposely stood solo, halfway across the field, staring down the Seahawks as they made their entrance. It looked an act of defiance, that he and by extension, his team was not going to go out without a fight. In the end though, Newton made too many mistakes. The Panthers, for all their resilience, had to be airtight to win this game. They weren't. It started with an early botched exchange with Jonathan Stewart -- a fumble that led directly to Seattle's first TD. The Panthers mounted an epic response to that first Seahawks punch, a 14 play, 8 minute plus scoring drive that ended with Newton hitting Kelvin Benjamin for the tying TD. They were soon down again after some Russell Wilson magic. On third down -- Wilson dropped an inch perfect pass into the hands of Jermaine Kearse, resulting in a 63 yard score, the longest postseason passing TD in Seahawks history. Wilson was a wizard on 3rd down the entire game -- 8-8 for 199 yards, 3 touchdowns and 7 first downs. We're used to him tormenting Carolina, both collegiately and now into the pros. As Wilson said afterwards "I'm made for these situations." Wilson's 4th quarter hook up with TE Luke Willson effectively ended the drama at 24-10. That play had come after officials picked up a penalty flag that had initially been thrown for roughing Newton. The no call doomed that Panther drive and gave Seattle some excellent field position that they did not waste. Kam Chancellor's pick 6 was just gravy. Chancellor though was a huge factor, thumping Mike Tolbert at one point and then audaciously and repeatedly vaulting over the Panthers O-line on a 2nd quarter field goal attempt. The mood afterwards was somber, as you'd expect. Josh Norman looked especially distraught, unable or unwilling to answer questions. There was optimism though. For all their regular season flailing, there's a belief in that locker room that this is a young team on the rise. Losing to Seattle, again, let's them know how wide the gap is between them and championship contention. Now they need to figure out how to bridge that divide.